I’m making matzo balls today (Yes. ALL DAY. Or most of it, anyway.) So once again, I am running one of my series of old blog posts in honor of my 9/10’s of a decade writing SoCal Mom. This one seemed appropriate as I prepare for Passover. It is from February, 2009. Yesterday, I mentioned how I’m suddenly back in the world of Facebook. I did not mention the look of horror on the face of my friend, “Elaine,” when she noted a recent addition to my list of friends. “You friended our Rabbi?? That’s brave. I’d be afraid for him to see my conversations!” she exclaimed. The truth is, I’m not too worried about this. For one thing, I like our rabbi. He’s smart, he’s funny and he strikes me as a very compassionate person… and while he’s obviously religious, he’s not intolerantly so. He’s exactly the type of person I would want to be friends with — if he wasn’t our rabbi. But I don’t think he’s spending any time reading my Facebook feed. He’s got hundreds of other Facebook friends (most of whom are probably REAL friends and not just anonymous members of the congregation). And let’s be real here – the extent of our relationship has been saying “hello” when we run into each other at Starbucks. I think he recognizes me as one of the flock… but he doesn’t know my name. We are not all that active in the synagogue. It’s not that I don’t want to be. I’ve lived in Los Angeles for 50 of my 53 years, but never felt a part of the community — until Megan started school and we joined the Temple (which is located a few blocks from our old elementary school and so was the synagogue of choice for about half of my daughter’s kindergarten class and some of the teachers, as well). Even my gentile husband — who resisted affiliating with organized Judaism — loves the people we’ve met and admits to enjoying himself once I drag him over there. But my daughter’s athletic commitment is a 500-lb. gorilla that overshadows everything else in our family. Between 16 hours per week of training, competitions and school — there’s little time for anything else. It’s a difficult balancing act, made more so by the fact that her father and I made the commitment to send her to religious school. She is supposed to go twice a week and attend a minimum number of Friday night services. A couple of years ago, we really tried to meet that standard — but as Megan moved up the USAG competition levels and her training became more rigorous, I’ve relaxed my expectations of her in the religion department. This year, she’s only attended one Hebrew school class per week and we haven’t been to any services outside of the High Holy Days. Even so, she’s on target for learning her prayers — and is even ahead of some of her friends in class who have 100% attendance. I know: I am blessed with a really smart kid. I am not a particularly spiritual person. I’m not sure what I believe. I want my daughter to be free to decide her own beliefs. I think she needs to understand her religious and cultural heritage before she can do that. If my husband had insisted that we raise her in the faith he grew up with, I would have been okay with that — but it would have been HIS responsibility to answer her questions about it. (Since I know next to nothing about the New Testament, how could I be the one?) I felt that if we did not pick one tradition or the other, she would grow up without an understanding of either. In the end, I guess I cared more about it than my husband, so our daughter identifies herself as Jewish — even if her dad likes to insist that she’s half-Christian. We can argue forever about how you are either Christian or not — there’s no halfway in religion — although you can be half-Jewish if you are talking about ethnicity. But I digress. 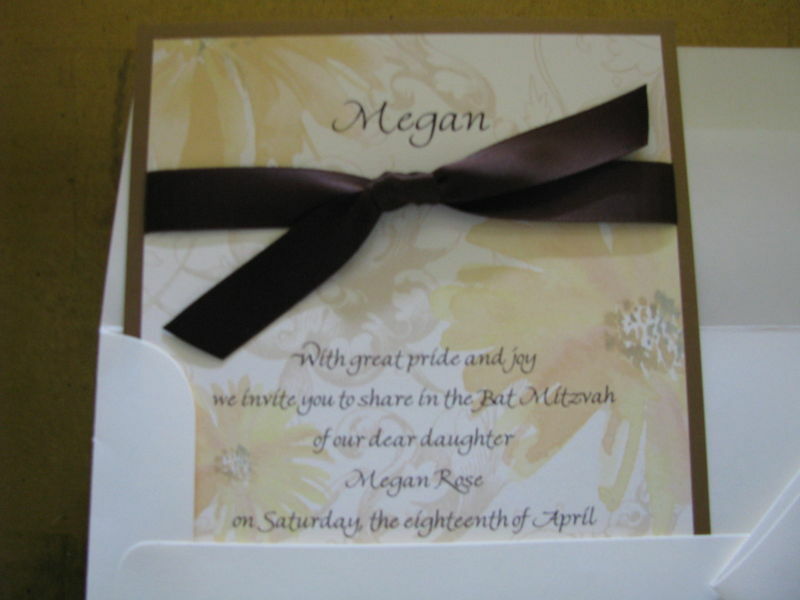 You see, Megan is turning 13 in April – and we’re on track for her Bat Mitzvah. This is something that was abstract six years ago, when we joined the synagogue. Now, it’s achingly REAL. I’ve written a couple of posts here, agonizing over the planning. The entire event is going to cost us about $2,000, most of that on the “extended kiddush” (lox, bagels, salads, desserts) we’ll be providing the guests after the ceremony. We will be hosting our immediate family and closest friends at a dinner that evening, which will likely cost an equal amount. My parents offered to help underwrite the cost and I gratefully accepted, because to be perfectly honest, I don’t know where this economy is taking us. We’re living on less this year. Altogether, this is a teeny, tiny fraction of what most people I know are spending on their events. Aside from the catering, the next largest expense was for the printed invitations; Megan wanted something pretty and I felt so bad about giving her such a “plain wrap” party, that I got her the ones she wanted. Now I’m worried that our friends and family will see these invitations and expect something a lot more elaborate than what we can provide. I dunno. All I can do is the best I can and I need to stop second-guessing myself. I just dropped about half the invitations in the mail (I’m still waiting for addresses so I can send out the rest). The train has left the station. As for the rabbi? We’re not so anonymous with him any longer, either. On Tuesday, we had our introductory meeting with him as Megan prepares for her big day. She wasn’t feeling well that day; I’d even kept her home from school. But I didn’t feel I could re-schedule our appointment with the rabbi, as this one was hard enough to get: Tuesday is the only day of the week Megan doesn’t have gymnastics and his schedule was pretty packed, too. So I brought my sick child in to meet with him and found myself babbling apologies over and over again about her gymnastics and how tough her schedule is. I mortified my daughter by insisting that I would send him a link to video of her (which I have thought better of doing, so have not followed up). I like to tell my kid that as her mother, it is my job to embarrass her — but I think I may have outdone myself on Tuesday. I embarrassed myself, too. My only consolation is that the rabbi is probably the one person I know who really understands Jewish mothers.